Jesse’s a 13-year-old boy who has a problem with authority. He doesn’t get along with his dad at all… much like his dad hasn’t spoken to his own father for years. So when Jesse comes home with a brand new suspension slip from school, Dad decides to leave him out of the family vacation to sunny Florida, leaving him at home in snowy Chicago with his Grampa. This revelation triggers confusion for Grampa, blurring the lines between reality and fantasy, and bringing Captain Liberty back to life. With Grampa suddenly determined to save the world from his imaginary arch nemesis Baron Mind, Jesse has little choice but to join him in his 1959 Cadillac “Liberty-Mobile” for a cross-country road trip to confront his enemy… in Hollywood. Enter Joe and Daniel, a pair of bumbling highwaymen hoping to rob their way across the country to a life of wealth and ease on the West Coast, whose path unfortunately parallels Grampa and Jesse’s. Finding themselves constantly hindered by Captain Liberty’s accidental interventions, their plans dissolve in an ever escalating series of misadventures, and Joe is left obsessed with putting an end to Grampa. Grampa’s insistence on avoiding freeways and using the back roads and highways of small town America, coupled with Jesse’s dead cell phone, means that a trip cross-country takes way longer than it should, and Mom and Dad have no idea where the daring duo are. And since Jesse was left in Grampa’s care, the police won’t treat it as a missing person case. So an under-resourced slow-motion manhunt unfolds, depending on local media to spread the news; but small town reporters are focused on the mysterious elderly man in the shiny helmet who seems to always be in the right place at the right time to ensure justice, and the story becomes more about the heroic Captain Liberty and his sidekick Liberty Lad than finding a confused elder and his grandson. As stories of the thwarted crimes appear, ambitious network reporter Zach Flynn sees a golden opportunity to exploit the resurgence of Captain Liberty. Aided by the vast resources of his network conglomerate and its opportunistic CEO, Zach makes plans to transform the pair into folk heroes who, if handled correctly, could generate a fortune in branding and merchandising. Thanks to a 24-hour news cycle and the power of the internet, the legend grows faster and bigger than anyone imagined. Unaware of their new found fame, Jesse and Grampa cruise toward California on the back roads. Along the way Grampa’s heroic nature, homespun wisdom, and innate decency soften Jesse’s shell, giving him a new understanding of the true meaning of family and honor. And for Jesse’s Dad, his worry brings new focus to making his relationships with his son and father healthy again. SWAT Teams, soldiers, throngs of fans, a terrible porta-potty mishap. and a taser are just a part of the recipe when worried parents, ruthless robbers and corporate interests collide and Jesse and Grampa finally confront the dreaded Baron Mind on the steps of L.A.’s Griffith Observatory. Like a cross between Home Alone and The Sugarland Express, this family adventure offers up reflections on intergenerational relationships, pride, and honor, porta-potties as transportation, and a few good fart jokes. 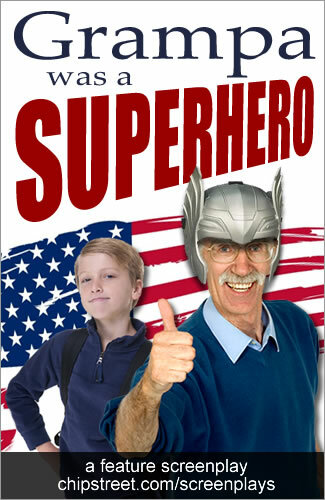 Grampa Was A Superhero is silly enough for the kids, yet still maintains real heart and a touching subplot that resonates with parents and grandparents alike.